Imagineering wrote: Please tell us Glen, that all these trees were premade before this Photo? Ok, you got me. Yes they were pre-made. In fact half of them were recycled off the old module. I stated the ground cover at 10am. then ballasting. Finished that at 12:30. Time off for lunch and to go down to the model shop for more supplies. Started again about 1:30pm, planted the 30 or so trees, bushes and grasses, (which were all pre-made), Finished about 4pm. In fact I've still got some trees left over, and my old smaller module that I stripped the points, track and trees off. I wonder what I should do with it? Oh no! the ideas are already going around in my head. I can’t help it, I’m addicted! p.s. I've still got more pre-made grasses and bushes to go on when I get time. I make them in batches in the summer when it's warm. So when I need to do scenery in the winter, they are all ready to go. Here is the whole thing put together for the first time at the show. I have got some video of the underground mine (which is quite popular), but won't have time to put it togerther tonight. Roll on day 2 tomorrow. I agree................... MOST IMPRESSIVE INDEED! A superlative well done from me! I must agree. I have noticed that many railway modellers simply glance at mini layouts and immediately right them off. 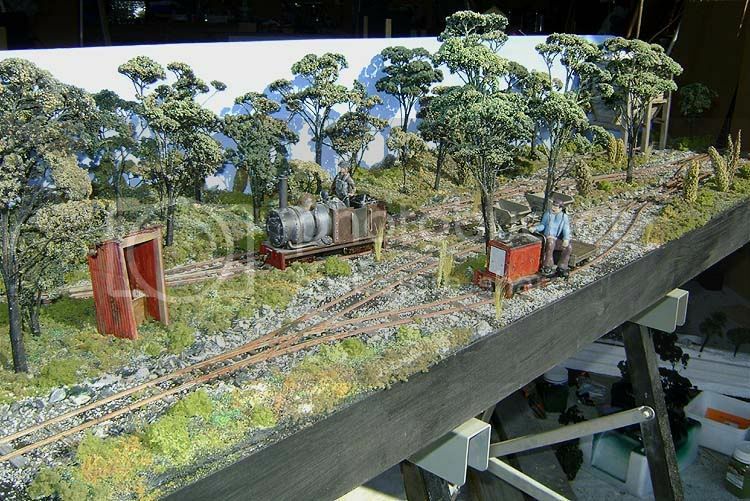 When I have displayed Mt Albert which is much larger they stay and talk even though the visible area is basically only a single end to end line with one siding. I'm happy to report that I now have the trophy for the best in show voted by the exhibitors sitting in my lounge. And I also got 1st place in the public vote too! So I’m feeling rather pleased. In fact it is the first time in 5 years that both awards have gone to the same layout. The next job is to tidy the garage and work out where I can store the new modules before I can do any new work. Glen Congratulations Very well deserved. (it's still processing but should be ready in a few minutes). Do you have any still pictures of the 'wheelchair' jigger I assume it is built on the Bachmann Candy Dancer chassis. as I said before BRILLIANT - and the video just adds to its brilliance - so much happening and it all appears to work (although would love to see how hard you have to work behind the scenes. 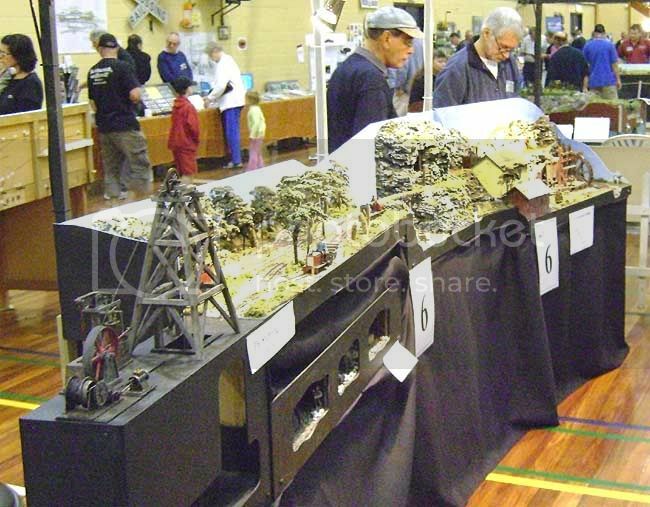 Well done Glen, the credit you deserve, the layout looks great. ...errm, that I'd seen it all together in the show setting. Congratulations Glen, not surprised it won both awards you've certainly raised the bar and to quote a long time member of this group "It's give up time, AGAIN!" Sadly he seems not to participate these days. The video shows that roundy roundy layouts aren't needed to hold the attention of youngsters from the comments heard on the film. Just add a few animations, mind you you have more than a few. As many have replied before, congratulations. It's a shame that you are so far away as it would be great to see it in the flesh. I get the impression that the photos are not enough! Fantastic video! Well deserved awards. Congratulations on your win Glen! 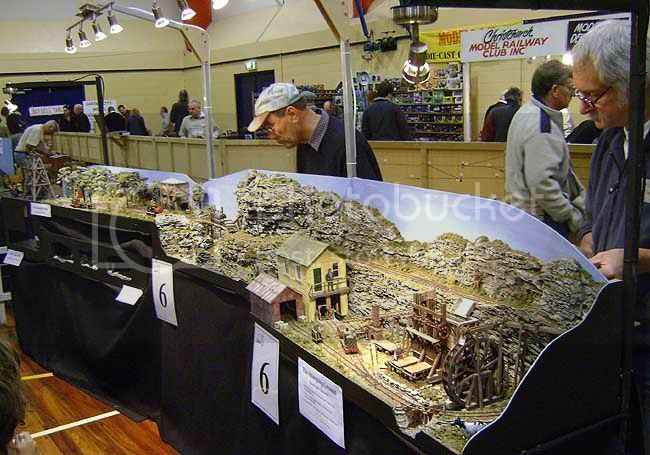 The layout looks truly impressive - bet folks stand in front of it for hours taking it all in. Glen I enjoyed the video, I had not realized how much animation that was included in your layout. Really well done details.